I have not long started the self treatment program. A little history of my problem. I am aged 60 with no health issues. My MRI shows a shallow annular bulge at L5 S1 with a posterocentral annulus tear. Combined with mild facet arthropathy, right greater than left, results in narrowing of the subartiicular recesses with slight flattening of the traversing right S1 nerve. I know a mouthfull right. I've had this issue for 8 weeks. I am unable to return to work. I tried chiro which was absolute rubbish. The treatments were very quick 10 minute sessions. Now I'm having remedial massage along with your self treatment program. My progress is very slow. I have no problem from the hips up its from my hips down where the issue is. Having said that my erector spinae muscles are very tight. However I still feel strong in the upper body and have no problem with lifting. I do however have serious issues with raising my right leg to my left knee, simple tasks like putting on underpants and pants or shorts, leaning forward to tie my boot laces or just crossing my legs. 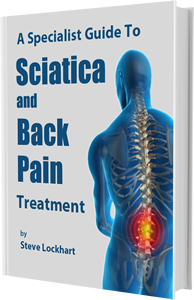 All of which used to be easy but are now quite painful and which aggravates the sciatic pain. Trying to do the SLM yoga therapy also aggravates. I am unable to squat down low after tge wall sit for example or sit back on my feet to stretch my quads. Just to painful.The sciatica seems to come and go to. Is this a sign that its getting better. I dont know. I have a zen chi machine but at the minute I just cant afford a vibration machine. I'm do frustrated because I've always condidered myself to be strong and never had back issues in the past. Do I go slow or keep persevering with the SLM yoga? Hi Rod get the Remedial massage work done on the legs especially quads and adductor muscles both sides but more on the right. It should be painful but tell the massage person to combine with heat and keep moving from leg to leg so as not to over do any of the muscles without giving them a rest in between. If you can get some length and function in those upper leg muscles you should notice a good improvement And combined with the SLM yoga you should see an end to the problem . Let me know how you go thanks Steve.